If you're serving guests for the holidays this year and want to wow them with a gourmet turkey at the table, forget the old standby of brining and roasting. Instead, try one of these five gourmet roast turkey recipes. From the spicy to the extra-moist, you're sure to find a turkey recipe that will impress your guests. This smoky/sweet turkey is a rich, red-brown color that will impress your guests before they even take a bite. Mix together the first six ingredients in a small bowl and set aside. Rinse and dry the turkey. Set it breast side up in a roasting pan that has a lid. Sprinkle one teaspoon of the seasoning mixture on the inside of the turkey and stuff it with the onion, orange, celery and bay leaves. Rub the body of the turkey with olive oil and cover the turkey with the remainder of the seasoning mixture. Make sure to get some of the seasoning beneath the skin at the neck as well. Add one cup of water to the bottom of the pan and cover. Set in an oven preheated to 400 degrees and roast for one hour. Uncover the turkey, baste it with the pan juices and add more water. Recover the pan and return it to the oven for approximately 30 minutes, or until the internal temperature reaches 170. Baste the turkey again and let it roast uncovered for 15 minutes to brown up. Remove the turkey from the oven and let it stand for 30 minutes. The internal temperature of the turkey should rise to approximately 180 degrees. Remove the fruit and vegetables from the inside of the turkey. The unmistakable flavor of truffles permeates this turkey, while the butter helps crisp up the skin and moisten the meat. Rinse the interior of the turkey and pat dry. 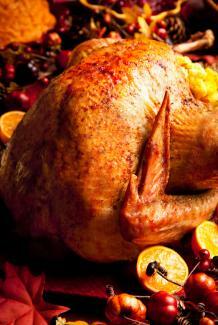 Gently loosen the skin of the turkey from the meat beginning at the neck and working back to the legs and thighs. Take care not to tear the skin. Rub 4 ounces of the truffle butter into the meat of the turkey beneath the skin. Massage the skin of the turkey on the outside to even distribute the butter. Sprinkle salt and pepper into the cavity of the turkey. Set the turkey breast up in a roasting pan and pour in 2 cups of water. 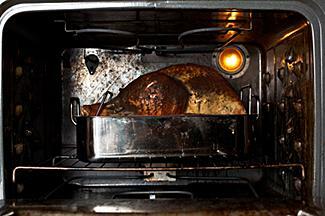 Roast at 450 degrees for 1 hour, baste the turkey, add the remaining cup of water and continue roasting until the internal temperature of the turkey reaches 170 degrees. Let stand for 30 minutes before carving. Make a gravy to accompany this turkey from the pan drippings. Pour the drippings into a saucepan, and add two cups of white wine and five tablespoons of flour. Whisk over low heat until thickened. The mixture of spices in this turkey recipe complements the flavor of the turkey perfectly, adding to each bite. Mix together the first six ingredients. Set aside one teaspoon for later. Mix the remaining spice mixture into the ginger, garlic, and butter until a paste forms. Loosen the skin off of the meat of the turkey, beginning at the neck and working back to the legs. Take care not to tear the skin. Rub the spiced paste into the meat of the turkey, beneath the skin. Massage the top of the skin to help evenly distribute the spice mixture. Cut the turkey giblets into small pieces and sauté them in vegetable oil on the stove. Add the scallions, carrots, celery, and ginger slices, and continue to sauté until soft. Pour in the rice wine and bring the mixture to a boil. Add the broth, soy sauce, cornstarch, and the remaining spice mixture. Stir well to combine. Set the turkey breast up in a roasting pan and pour the broth mixture around it. Cover the pan and roast at 450 degrees for 1 hour. Baste the turkey and continue roasting it until it reaches an internal temperature of 170 degrees. Let stand for 30 minutes before carving and serving. This sweet-coated turkey is succulent and moist. To get the best results, use a kosher turkey if possible. Combine the first five ingredients in a small saucepan. Heat on low until the sauce simmers and the jam reduces to liquid. Strain the jam mixture to remove any solid pieces and set aside. Rinse the turkey and pat dry. Coat both the interior and the exterior of the turkey with the jam glaze. Set the turkey in a roasting pan at roast for 30 minutes at 425 degrees. Reduce the temperature to 350 and brush melted butter over its surface. Continue roasting, basting with melted butter every 30 minutes until the internal temperature reads 170 degrees. 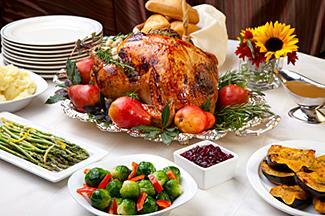 Morton Thompson's gourmet turkey takes an enormous amount of preparation, but the results are well worth it. 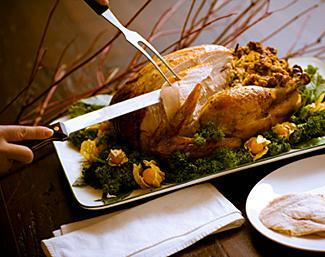 Once its crust has been removed, a Thompson turkey is so tender, it can be carved with a spoon. Season the interior of the bird with salt and pepper and set aside. Chop the gizzard, neck and heart of the turkey and place them in a saucepan. Add 4 or 5 cups water, a teaspoon of paprika, half a teaspoon of coriander, a clove of garlic, and salt to taste. Let this simmer while you assemble the dressing. In a large bowl, combine the apple, orange, pineapple, crystallized ginger, lemon rind, and water chestnuts. Set aside. In a second bowl, combine the mustard, caraway, celery seed, poppy seed, oregano, black pepper, bay leaf, mace, parsley, garlic, onion, turmeric, celery, marjoram, savory, and poultry seasoning. In a third bowl, combine the bread crumbs, veal, pork and butter. Mix together each bowl well, and then mix the three together. Continue mixing until a thick, doughy paste emerges, and then toss it to loosen it up. Stuff the turkey, packing any extra stuffing into the neck skin and beneath the skin of the bird itself. 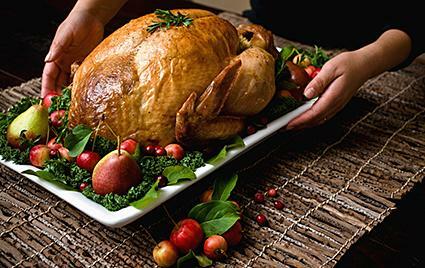 Place the turkey breast up inside a roasting pan and put it in an oven heated to 450 degrees. Quickly combine the onion juice, lemon juice, egg yolks, dry mustard, garlic, and flour until a thick paste forms. Wait until the turkey is beginning to brown, then remove it from the oven and lower the heat to 325. Brush the paste over every visible area of the turkey and place it back in the oven. Wait until the paste on the turkey dries out, and brush more paste on top. Continue drying and adding the paste until you use it all up. Add the cider to the giblet stock. You will baste the turkey with this mixture. Baste the turkey with the giblet stock every 15 minutes. Replenish the stock with cider and water when it gets low. Let the turkey cook for a total of 5 hours. The paste will turn black, dry, and crumble. This is normal and is not hurting the turkey. After 5 hours, remove the turkey from the oven and use tweezers to remove the crust. The turkey should be golden brown and cooked perfectly inside. Let it stand for 30 minutes before carving and serving. Cooking a gourmet turkey may require some extra preparation, or in the case of the Thompson turkey, an entire day. Make sure you give yourself plenty of time to cook, and don't forget to take a look at your guests' faces as they try your gourmet turkey.